A student who has lost registration eligibility by failing to register for two or more semesters in an academic year (including summer semesters) and who wishes to return for the same admission classification and major must submit an application for readmission to the Office of Graduate Admissions. The appropriate application-processing fee is required for all applications. If the student has not been granted a leave of absence from enrollment, s/he may be required to pay a penalty for non-compliance with the Graduate Enrollment Policy, see Enrollment Policies. You must complete an application for admission. You must submit the application-processing fee. 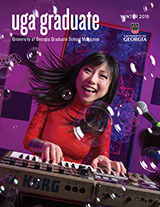 Recently enrolled former UGA graduate students may qualify for a reduced application fee of $25, if they are applying for readmission to enroll within four semesters (including summer semesters) of their last semester of UGA graduate enrollment. Former UGA graduate students who apply for readmission to enroll more than four semesters after their last semester of enrollment must submit the full application fee. If you have attended any other institutions since your last enrollment, you must list those institutions and submit official transcripts from these institutions. After submission of your application, the academic department will review your records including your application. Contact your academic department for information on deadlines and additional admission requirements. To begin the application for admission, click here.